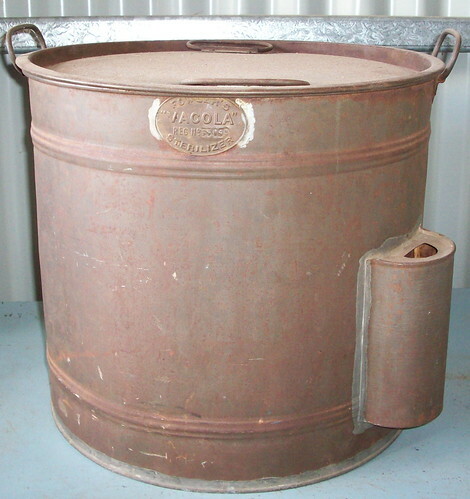 The Vacola Preserving outfit was used in most homes in the early days. (especially in the country) This model sat on top of the stove. Eight large glass jars were filled with fruit and syrup and rubber rings, lids and clips added. The jars of fruit were placed in the unit and water was added so that it came about 3/4 up the jars. After bringing to the required heat the bottles of fruit were kept at that temperature for about 2 1/2 hours by which time the bottles were sealed. By preserving excess fruit of many varieties the household enjoyed the produce all year.